Curly in the City: all laced up! Having a real bad itch to own some cute little shoes with laces. I want to be all laced up! When it's finally warm enough to expose some skin - that is! And please tell me why these wedges have to be sold out in my size......why I ask! May have to go to a few stores to see if they can call around, they are the perfect shoe - work and weekend, yup yup! And those pumps! After seeing Liz wear them, I kinda want them too! She made them look so dang cute! Are you in with the laces?!?!!!! I'm SO in with lace!! And I love all of these picks. I need to pull the trigger, i love them but i really need more day shoes that night shoes, but but they are so dang cute!!!!!! Yes, dying for those Zara ones too! Great line up. Love this look. #3 is my favorite. So cute! I loooove the third pair! Those are absolutely darling. yes, definitely in with the laces! for some reason, the blacked laced prabal gurung for target didn't fit me, but still on the hunt of the perfect laced pair of heels! 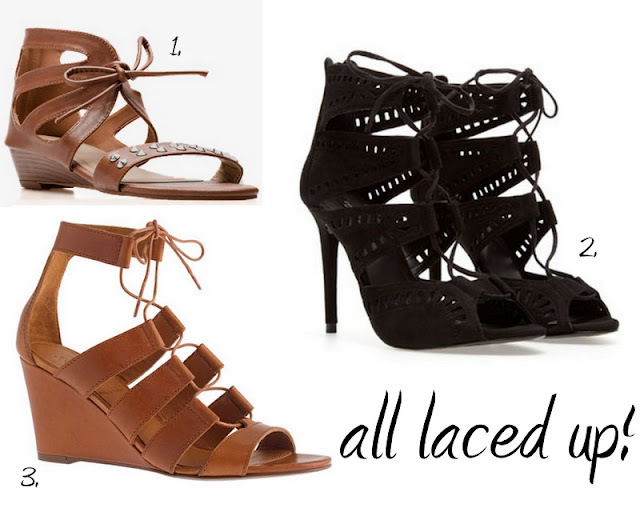 I loved gladiator sandals & am even more in love with this seasons high heeled & wedge styles!